Pier Vittorio Aureli. 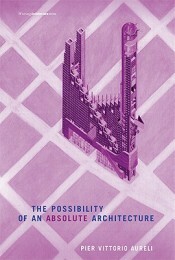 The Possibility of an Absolute Architecture. MIT Press, 2011. 251 pp. As for the question of form more specifically, Aureli’s presentation consists in distilling architectural set-pieces down to two: On the one hand, to the prototypical part set apart exemplified by Ludwig Mies van der Rohe’s plinth—an elevated base raising buildings like Seagram in New York City up from the street introducing “stoppage into the smoothness of urban space” (40-41); on the other, the more general composition of these separating parts into an archipelago, “the city made by agonistic parts” (42). In the process of distilling these two basic, opposing forms, the book’s attention rarely strays far from the contradiction that most urban development today, at least on the level of municipal policy, tends to endorse the ‘city within a city’ model though for very different reasons. What, in Aureli’s account, distinguishes the archipelago from its namesake, such as iconic superstructures or gated communities tarring our urban fabric today, is its unique ability to separate and thus formalize positions without relying on a center. The archipelago, unlike the city, “presupposes that its parts, even in their absolute separation are moved by an absent center, toward which each island, in communion with the others, is oriented without claiming possession of this center” (42). Taken to its extreme, the radical rupture materialized in the archipelago, for Aureli, amounts not to an architectural form to be repeated, but a “counterform” to be confronted, an architectural act insisting upon political events. The version of archipelagos endorsed here is in the final instance not bound within urban spaces, but rather generates the pressure to dissolve the faculties of urbanization tout court. At first glance, Aureli’s methodology appears out of sync with his political motivations to block the circulatory mechanisms of urbanism, as anyone who has stood in front of van der Rohe’s corporate palaces at Seagram or Toronto-Dominion will recognize immediately. We tend today to think of van der Rohe and his many mid-century disciples as the progenitors of corporate architectural protocol, rather than an architectural “project” where “agonistic form” (40) meets the urban. The same can be said about four of the five architects Aureli endorses in Absolute Architecture—Palladio, Piranesi, Nolli, and Boullée—all of whose works, while tending towards finite irruptions of smooth urban space, also accelerate the infrastructure of today’s urban world. For Aureli, however, the point is not so much to collapse the capitalist function of a building with its architectural form, but to insist rather on the composite and at times disparate parts of what in the end makes possible the “autonomy of the project” as opposed to the “autonomy of design,” the distinction being that “design reflects the mere managerial praxis of building something, whereas the project indicates the strategy” upon which “an act of decision and judgment on the reality that the design or building of something addresses” (xiii). As an active architect and architecture theorist well versed in the tradition of radical Italian architecture of the Manfredo Tafuri and Superstudio variety, Aureli comes equipped with ample anti-capitalist projects for the city. (Indeed, Aureli’s previous book The Project of Autonomy in many ways creates the theoretical space for Absolute Architecture, and the architecture collective Dogma, which he helped found, asserts a necessary postface here.) The hypotheses of Absolute Architecture, though, is not that we can imagine a different city as a whole (i.e. the hyperbole of Superstudio’s Continuous Monument and the Situationists’ New Babylon or, in a different vein, the clean slate planning of 1920s Russian Constructivism and Le Corbusier), but rather that a different idea of the city made of antagonistic parts persists as a fundamental component of architectural form all along. When Aureli endorses German architect Oswald Mathias Ungers as the capstone of Absolute Architecture’s project in the final chapter, the urgency of thinking form as blockage amidst building as integration is made clear. The final chapter’s story goes that as West Berlin reached its apex of cold war crisis in the 1970s (crippling depopulation, extensive urban blight, and plummeting property values) Ungers along with Koolhaas and members of his then new firm OMA conceived a “rescue project” named Green Archipelago. At its core, the initiative worked immanently to Berlin’s urban condition to strategize two radical outcomes. First, Ungers and OMA embraced Karl Friedrich Schinkel’s nineteenth century plans for a Berlin (then capital of Prussia) unified not by a coherent city schema but by its singular architectural punctuations. Industrialization and fascist neo-classicism had long since forced city planners to abandon Schinkel’s plan in exchange for integrative zoning, but the formal debris and clustered layout of a city made of singular parts nonetheless remained. For the 1970s team, this meant splicing parts in order to cluster densities and then formalize those clusters into architectural archipelagos. As a response to the city’s shrinking population and architectural decay, in other words, Ungers and OMA tabled a plan to reduce the city’s size into separate parts, an experiment antagonistic to the more common failed ideology of planned economies by way of planned development. Green Archipelago’s second outcome links the Berlin experiment to Aureli’s more general interest in tracing the contours of a political architecture in the first four chapters. Rather than leaving sections of the city open to an urban division of function and labor, Unger’s insisted on the superblock typology of self-sufficiency and self-management imported from interwar architecture experiments in Vienna and nineteenth century communes in America (a topic on which he and his wife published Kommunen in der Neuen Welt in 1972). Coupled with Ungers and Koolhaas’ ideas on bigness and anonymous simple forms, the superblock, rather than the megastructure or tabula rasa cherished by so many of Unger’s contemporaries, gave the team a typology tailored for political separation. More to the book’s overall premise, the superblock serves as the most recent architectural invention of an absolute form when retracted from its urban condition into an archipelago of superblock islands. What the team imagined made its plan Green was equally, if not more, important politically to the superblocks that would form the archipelagos of Berlin. Opposed to contemporary theories of environmental productivity, Ungers and OMA sought to render the in-between space (the “sea” separating the “islands” ) into “on the one hand the practice of what today would be called ‘zero-mile’ agriculture—fields in which the inhabitants of the islands could manage their own food supply and thus make the economy of their settlement independent from larger systems” (225), and on the other hand a permanent force of decentralization. For Aureli, what therefore makes the Green Archipelago project exemplary is its insistence on limiting circulation, thus facilitating economic disruption. But of course economic disruption, by which Aureli in part means blocking the accumulation of surplus-value through urban arrangements, is as historically specific as the politics with which it is confronted. Aureli’s argument about space relies on a Marxist theory of accumulation, where urbanization is another name for the real subsumption of space into economic production and circulation through the division of labor (26). So, while the book’s modus operandi is simply to trace instances of the archipelago through four historically specific moments (sparingly, but nonetheless consciously linked to particular logics of economic accumulation), the stakes more complicatedly implore us to politicize architectural form today. In the terms set out in Absolute Architecture, an absolute (which is to say political) architecture amounts to a project altogether antagonistic to the production of surplus value likely linked but not identical to what it meant to accumulate capital in Europe during the sixteenth and eighteenth centuries or even in Berlin during the 1970s. Were there to be a concluding chapter to Absolute Architecture, it would insist, most likely, on a separation from and thus blocking of something closer to the speculation of finance capital. Yet the trouble is imagining architecture as itself anything other than speculation, when whether through fluctuating property values, its enigmatic relationship to derivatives trading through the secondary mortgage market in the US, or the labor power concealed in every stage of its production, architecture is nothing but the formalization of surplus-value. For Aureli, however, the point all along was to separate architecture from its urban tendency; a possibility he insists is most recently viable in the archipelago. Today, when the condition has become financialization (which is to say circulation and speculation), the prospect for an absolute architecture has never seemed less possible, but only because the possibility is always tied to strategies of which we seem to have few. Aureli’s account of form builds on the work of Carl Schmitt and Jeanne Hersch (30). See David Harvey, “The Art of Rent: Globalization and the Commoditization of Culture” in Spaces of Capital and Fredric Jameson’s “The Brick and the Balloon: Architecture, Idealism and Land Speculation” in The Cultural Turn. Jeff Diamanti studies architecture theory, creative industries and the recent history of property. He is working on a dissertation entitled How We Build Today: Culture, Commerce and Place in the New Century in the Department of English and Film Studies at the University of Alberta.